A couple of new vases. 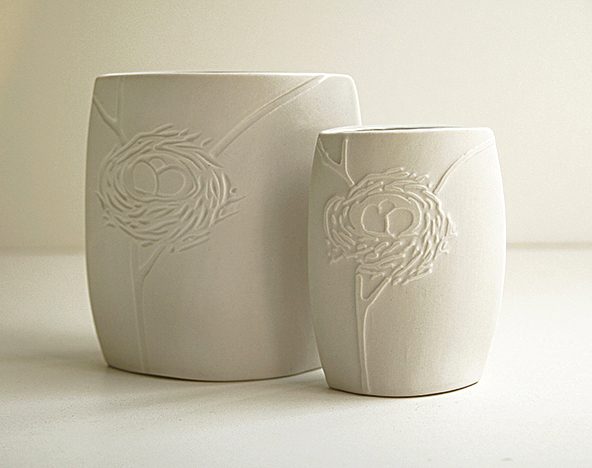 The nest on the larger vase is carved, and the one on the smaller vase is water-etched. Very nice detail, when you water etch are you putting wax down first? Hi Walter, I actually use “Liquitex Acrylic Matte Varnish”, but you could also use wax. The key is to really let the vanish dry, and the piece as well before wiping the clay around the varnish away. Otherwise the sponging will erode the varnish. Let me know if you decide to try it!